Dorothy L. Kruse, 100, Wahpeton, ND, passed away Thursday, May 30, 2013 at St. Catherine's Living Center, Wahpeton, ND. The Funeral Mass will be Friday, June 7, 11:00 a.m., at St Anthony's Catholic Church, Mooreton, ND. Visitation will be one hour before the service at the church. Interment will be at St. Anthony's Catholic Cemetery, Mooreton. Vertin-Munson, Wahpeton, is in charge of the arrangements. Dorothy Louise Kruse was born in rural Fairmount, ND on December 20, 1912, to Charles and Florence (Williams) Solomon. 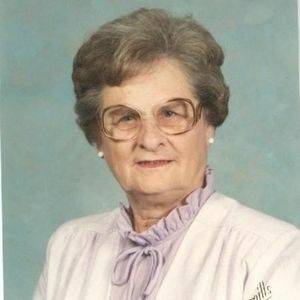 After attending a rural school near Fairmount she moved with her family to rural Barney area where she graduated from the Antelope Consolidated High School in 1930. This was the first class to graduate from the school. She attended Valley City Teachers College and obtained a teaching certificate. She taught seven years in rural schools in Nansen and Homestead Townships. On June 2, 1936, she married Gilbert Kruse in Mooreton, ND. They moved to a farm in rural Barney area where they lived for 3 years and in 1939 moved to a farm in Colfax area where she lived for 63 years. Gilbert died April 4, 1981. She moved to Wahpeton in August 2002 and entered St. Catherine's Living Center May 30, 2003. After they retired they did some traveling and spent several winters in Pharr, TX. She liked to read, travel, flower gardening, watch sports, and enjoyed music, dancing, and camping at the lake. She also greatly enjoyed when the grandchildren and great-grandchildren would come to visit. Dorothy was a member of St. Anthony's Catholic Church and the Guild, Royal Neighbors, Nansen Homemakers, and was a 4H leader for 10 years. She belonged to the Colfax Senior Citizens and Richland County Historical Society. Dorothy is survived by one daughter, Janice (Duane) Guck, Pharr, TX; 3 grandchildren, Michael (Jean) Guck, Richville, MN; Edward Guck, Edina, MN; and Jackie Edmond, Vadnais Heights, MN; 6 great-grandchildren, Jonathan, Carmen, and Sara Guck, Jake England, and Darlya and Eryka Edmond; and 4 great-great-grandchildren. She was preceded in death by her parents, her husband Gilbert, an infant son, and one sister, Esther Ehlers. Sincere sympathy to all of Dorothy's family. She was one of my favorite neighbors for many years at Colfax. I last talked to her on her 100th birthday! God bless all the wonderful memories of a great lady and special friend!